After fighting a difficult battle with depression, Sandra (Marion Cotillard) is ready to return back to her place of employment. However, the young Belgian mother discovers that her co-workers must vote whether they would prefer a sizable pay bonus, or allow Sandra to keep her job. She has only one weekend to convince her colleagues to give up their bonuses, so that she can keep her job. With the support of her husband, children, and close friends, she must find a way to put the odds in her favor. This deep Belgian drama about one mentally unstable, yet gracefully powerful woman on a mission to save her job, urging her colleagues to face a moral dilemma, is probably more suspenseful than most thrillers out there, giving the realistic nature of its subject matter. • Jean-Pierre and Luc Dardenne - in this new video interview, directors Jean-Pierre and Luc Dardenne explain what inspired them to shoot Two Days, One Night (the novel La misere du monde, which was written under the supervision of Pierre Bourdieu, and Francois Bon's novel Daewoo), and discuss the main dilemmas Sandra faces in the film and her relationship with her husband, the real social situations people face today and how some company owners avoid unionization, the production process and Marion Cotillard's performance, etc. The interview was conducted exclusively for Criterion in April 2015. In French, with optional English subtitles. (52 min, 1080p). • Marion Cotillard and Fabrizio Rongione - in this featurette, Marion Cotillard and Fabrizio Rongione explain how they prepared to play Sandra and Manu and discuss the difficult choices their characters are forced to make. The interviews with the two actors were conducted exclusively for Criterion in early 2015. In English and French, with optional English subtitles where necessary. (23 min, 1080p). • On Location - in this featurette, directors Jean-Pierre and Luc Dardenne return to some of the key locations used in Two Days, One Night and explain how various sequences were shot. (Split-screen comparisons are included). The featurette was filmed exclusively for Criterion. In French, with optional English subtitles. (37 min, 1080p). • When Leon M.s Boat Went Down the Meuse for the First Time (1979) - presented here is the Dardenne Brothers' second documentary film, which takes a closer look at the general strike that paralyzed Belgium in the winter of 1960. (It was one of the last big general strikes in Western Europe). Included in it are clips from interviews with people that participated in the strike as well as archival footage showing some of the demonstrations and clashes. In French, with optional English subtitles. (39 min, 1080i). • The Dardennes on Leon M.'s Boat - in this new video interview, the Dardenne brothers discuss their early documentary films, their relationship with Armand Gatti (who inspired them to become filmmakers), the impact various political events had on their career and work, the shooting of When Leon M.s Boat Went Down the Meuse for the First Time, etc. The interview was conducted exclusively for Criterion in April 2015. In French, with optional English subtitles. (21 min, 1080i). • To Be and I - in this new video essay, critic Kent Jones discusses the reality in which the protagonists in the films of the Dardenne brothers exist and the theme of hope that is present in all of them. The essay was created exclusively for Criterion. In English, not subtitles. (9 min, 1080p). 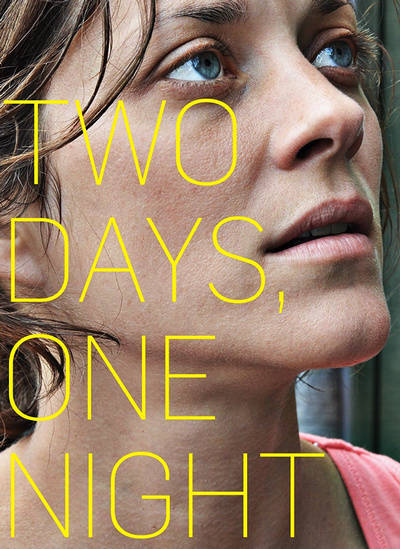 • Trailer - original U.S. trailer for Two Days, One Night. In French, with imposed English subtitles. (2 min, 1080p).